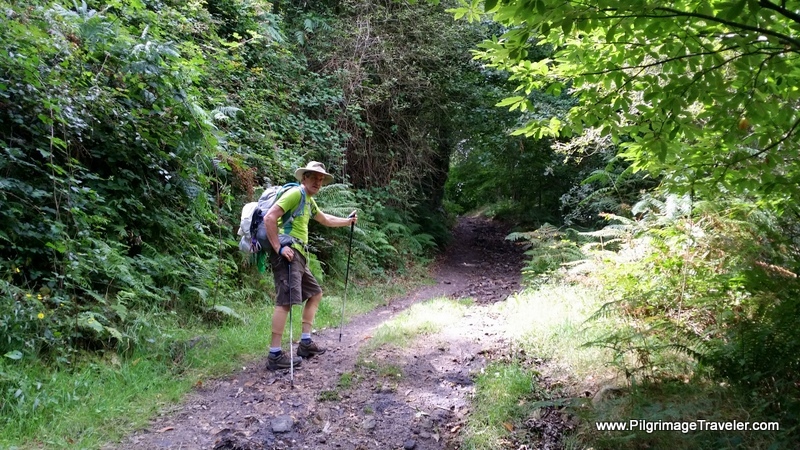 If adversity builds character, then day three on our Camino Primitivo was a character-building day for me! It only took my husband and I until the 3rd stage of the Original Way to run out of our emergency food. Combine this lack of preparedness with the lack of support facilities on the Camino Primitivo, and the set-up for a miserable morning was in place. Here is our Google map of the GPS tracks for our day three on the Camino Primitivo. Fortunately, for our aching feet and shin splints, the pavement walking was only about 50%. We encountered more lovely forest paths on this stage of the Original Way. Approaching Cornellana in the beginning part of the day, there are two options of walking. A scenic alternative to the monastery is available, designated on the map as point A to point B, if you do not need food in town. 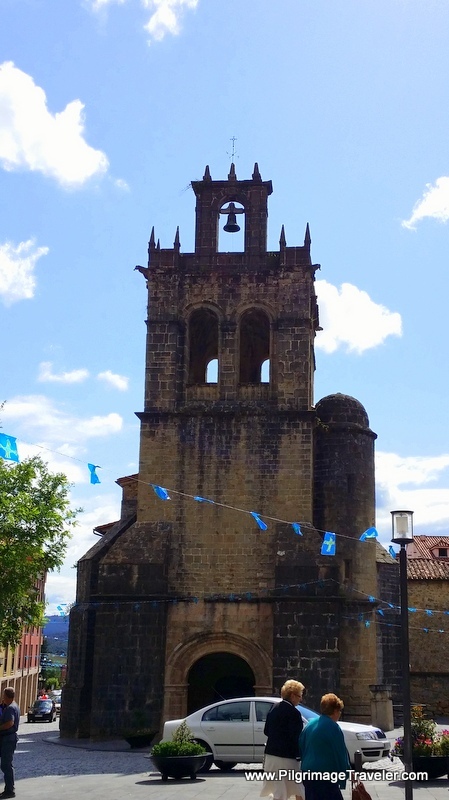 This used to be the standard route, but more recently the Camino was re-routed through town. This is a good thing if you need groceries or a café and are planning to overnight at the monastery. Looking at the elevation profile maps, shown below, you can see the many ups and downs of our personal day three from La Doriga (3.0 km before Cornellana) to La Espina. The long climb of about 570 meters (1870 feet), without much reprieve from the low at Llamas, about 4.5 km after Cornellana, to La Espina will feel strenuous! 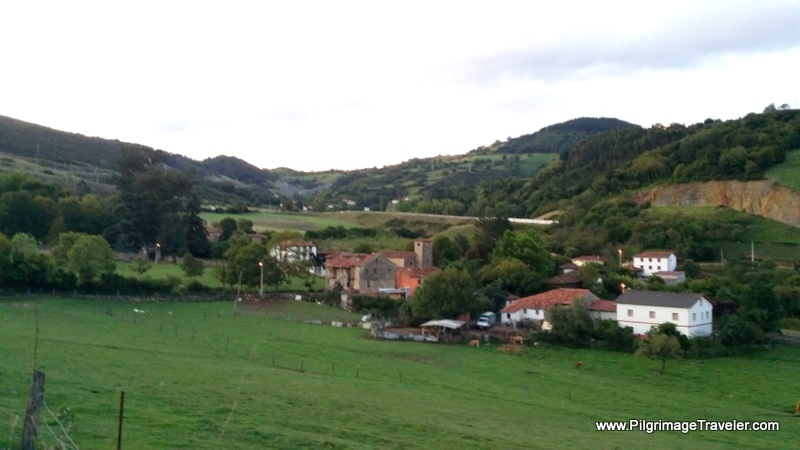 Our day three on the Camino Primitivo started out well enough at 07:30, just at daybreak on this day in August. There was no sunrise to speak of, my shins felt better, and my throat that was sore yesterday seemed to only be a bit of post-nasal drip this morning. I breathed in deeply as I walked, sending loving, healing energy to my throat on the exhale, willing it to be OK.
We left our private albergue without breakfast. We had no food in our pack, as Doriga was a tiny place with nowhere to buy food. I broke my cardinal rule of having nothing to eat when we set out for the day. 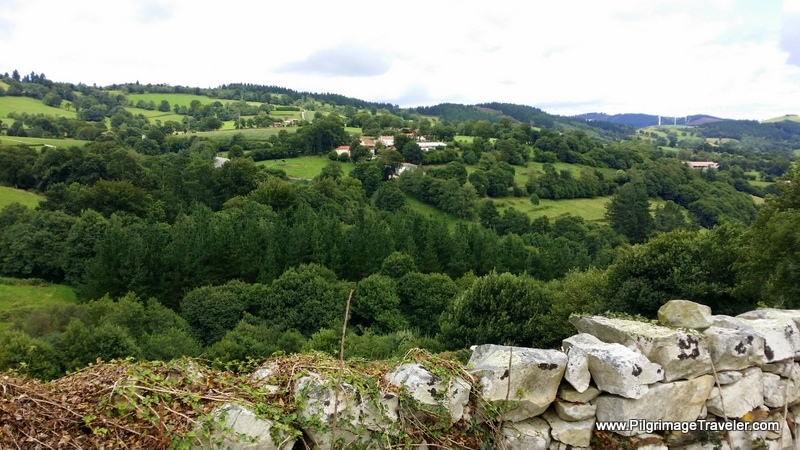 (See Camino Planning Tips for more useful suggestions.) First mistake - poor planning. We should have obtained more food in Oviedo or Escamplero. The sole proprietor of the albergue was working so hard the day before, a Sunday, with a full house that was partying all day and well into the evening. He would have gotten up early for us to ensure our breakfast, but he looked so exhausted on Sunday night that we told him we could walk the 3 km to Cornellana for breakfast, without a problem. Hmm, second mistake. 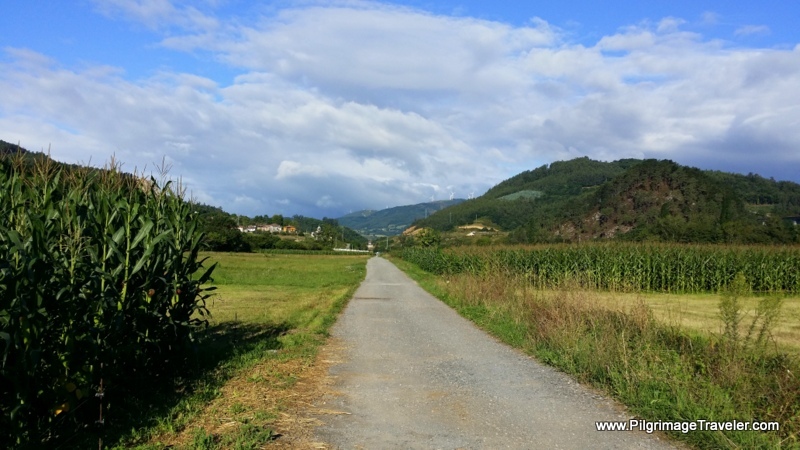 Our day three on the Camino Primitivo started out on a nice semi-paved lane as it left Doriga and quickly turned into a quiet lane. 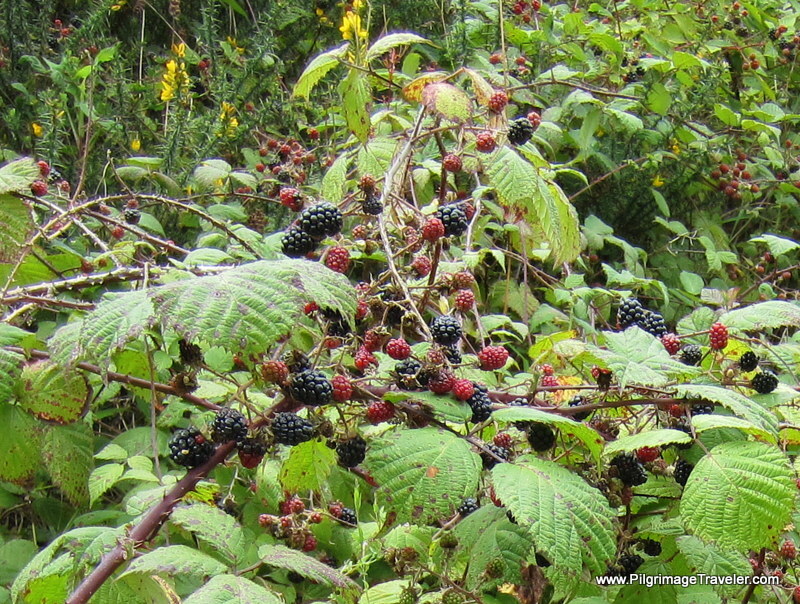 This country lane was lined with wonderful juicy blackberries. We stopped to pick and eat several handfuls for our breakfast. Within less than a kilometer, the Original Way yields to the AS-15. Fortunately, there are worn paths on the side of the road on which to walk safely. 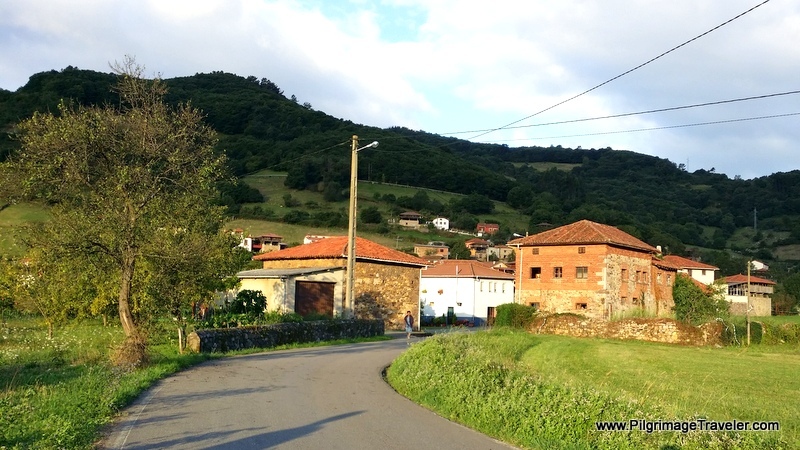 The Original Way then leaves the AS-15 and turns left onto the N-634 (which it follows nearby for most of the day), heads West and crosses the River Narcea into Cornellana. Immediately after crossing the bridge, is the alternative route along the river, shown as point A to point B on the map. 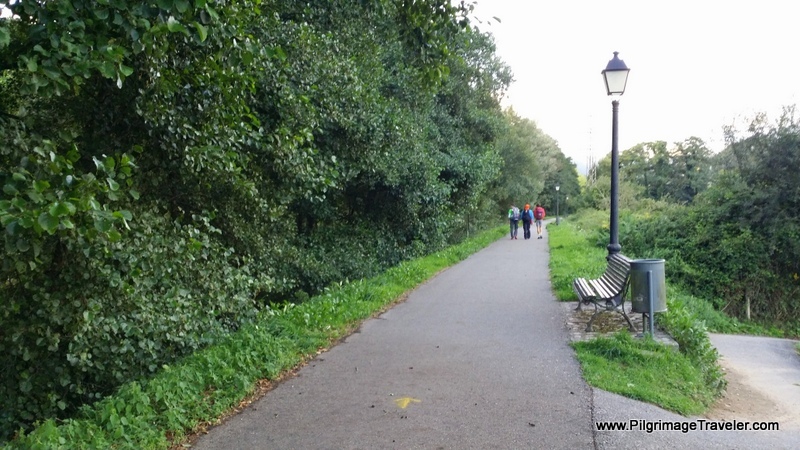 This was the old route, turning left after the bridge to follow this lovely footpath by the river, towards the monastery. This alternative is the path we took, before the route changed to stay on the N-634 through town. 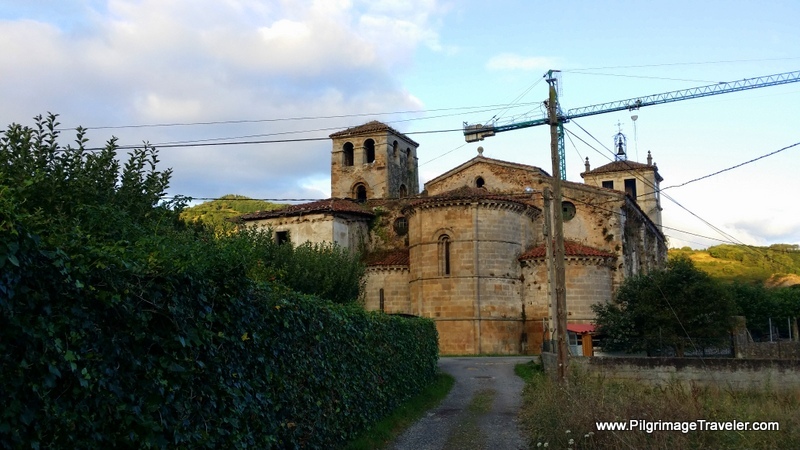 If you stay on the standard route through Corellana, you will pass by many cafés and a supermarket on your way to the albergue in the monastery. After about 1/2 kilometer, you turn left, or south and head for the monastery. The Albergue de Monasterio de San Salvador has 36 places and I have heard lovely reports about staying here from fellow pilgrims. As we approached the monastery from the alternative river path, it's hugeness was a surprise! As you can see it was under re-construction when we were here. The interior of the church is 12th Century and the façade is 17th Century. The workers had already begun their day by 8:00 a.m. We hung around the monastery for about 15 minutes, absorbing the energy of the place. I felt some regret that we had not stayed here. It was a fantastic place. It was 8:15. The monastery was on the outskirts of town. We guessed that a walk into town was about a half kilometer or more. It was too bad for us that the new route through town had not yet been established. Our experience was that very few café bars open up prior to 9:00 or 10:00. We made the decision to keep on going, thinking there would be another open bar along the way soon. Third mistake. (Supposedly there IS a bar in town that opens at 06:00). Because of the blackberries that we had already eaten earlier, my stomach was content in this moment. We went onward. 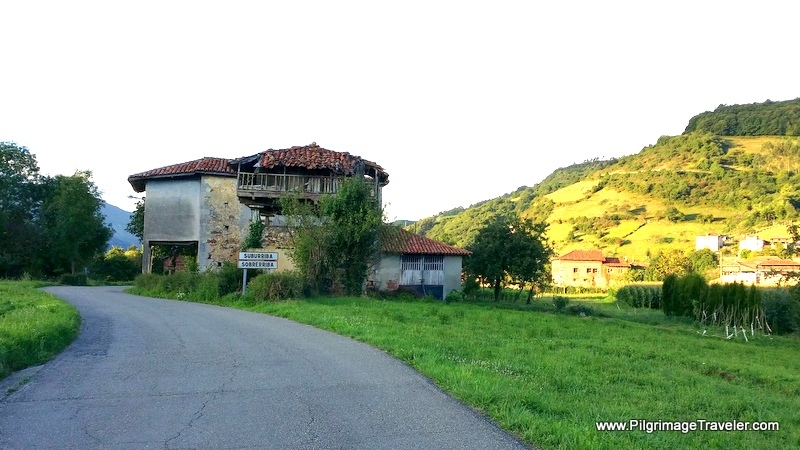 We began a long climb uphill behind the monastery on the SL-7 towards Sobrerriba, the next hamlet. 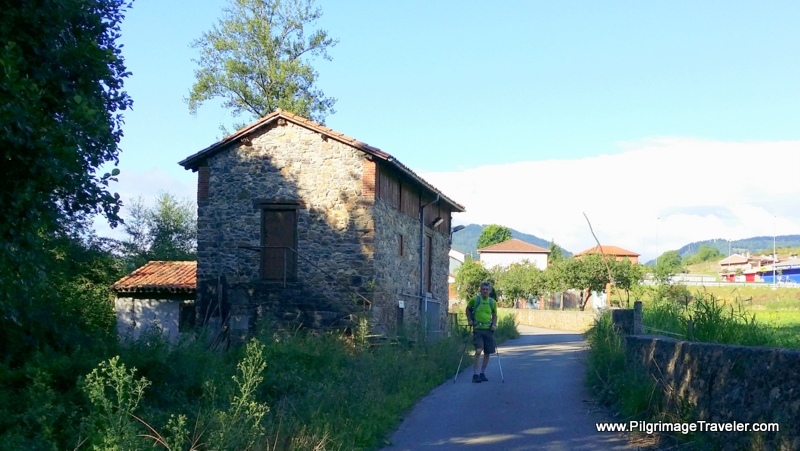 The sunlight was dancing on the distant hill as we entered the town on day three of the Camino Primitivo. Sunlight continued to glow on the town of Sobrerriba as we approached the main cluster of buildings. 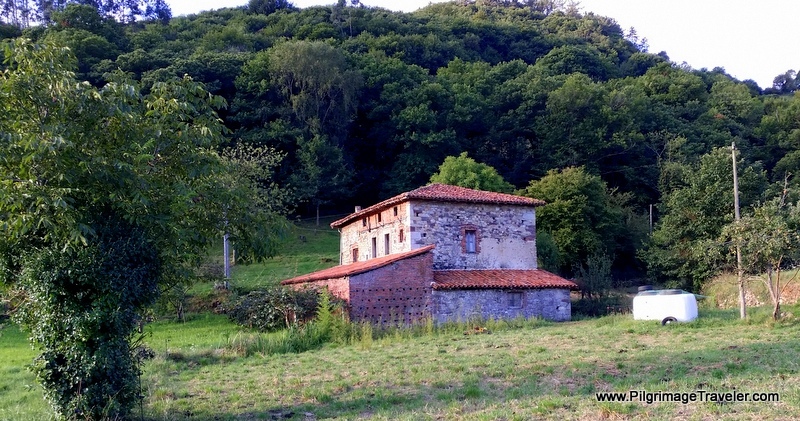 A lovely, but abandoned homestead near Sobrerriba is pictured below. It was near this spot that we came across 3 young Spanish pilgrims, chatting with an older, local man, who was working outside in his yard. As we strolled by, and said hello, the Spanish pilgrims joined us and we chatted amicably as we walked down the road together. All of a sudden, a car coming towards us, slowed down to talk to us. 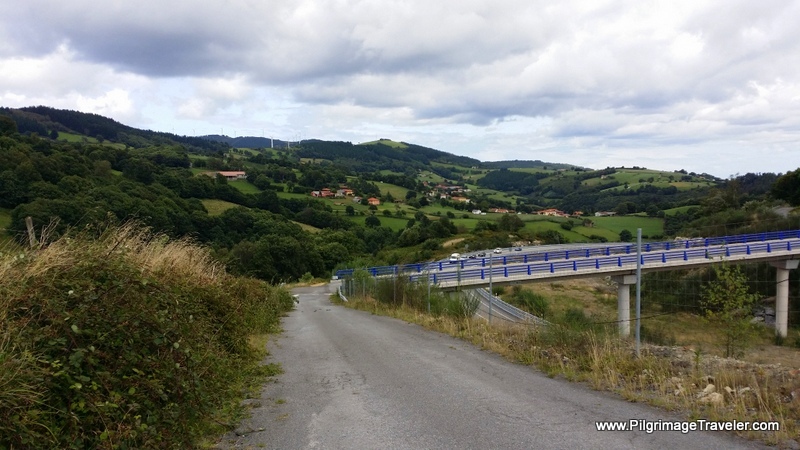 It was the same local man, who had quickly jumped into his car to come tell us that we had missed the Camino turnoff onto a path, a bit farther back down the road. What a angel! We were so busy chatting that we missed the turn, admittedly it was a bit obscure, but if we had been paying attention, most likely we would have seen it. The local gentleman must have been watching us, as walked on by the turnoff! I think he may have placed himself outside, for this very purpose. Who knows? Whatever the case, he was yet another Camino angel. 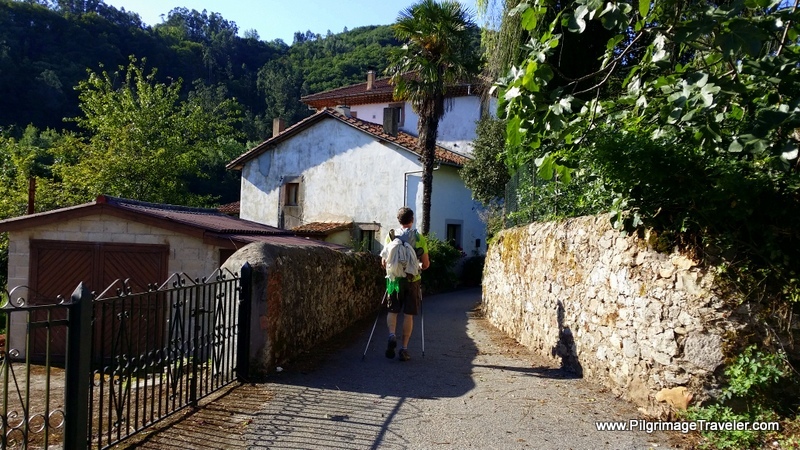 As the saying goes, whatever the pilgrimage traveler needs, the Camino will provide. Indeed, the tart apple, though gnarled and small, was a welcome respite to my empty belly. About a half an hour later down the road, Rich stops and says - "Check out these!" There were nuts on the ground below his feet. I had totally missed them. He cracked one open, and ate it. It was a hazelnut! 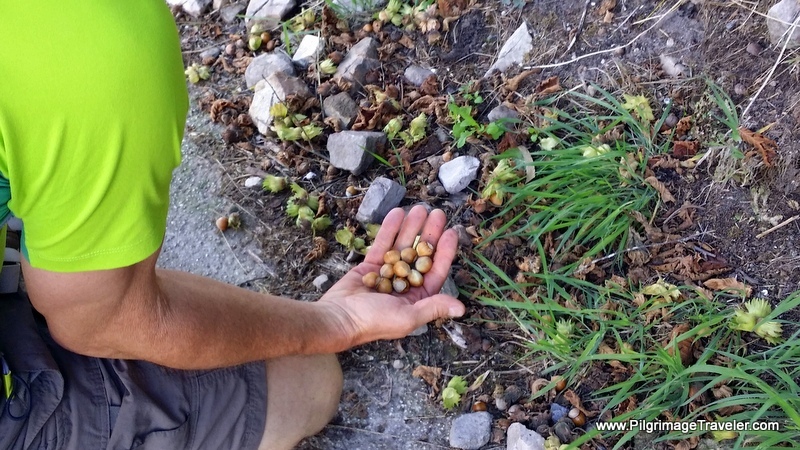 While it was a bit difficult shelling them, we did eat quite a few of the hazelnuts. Yum! 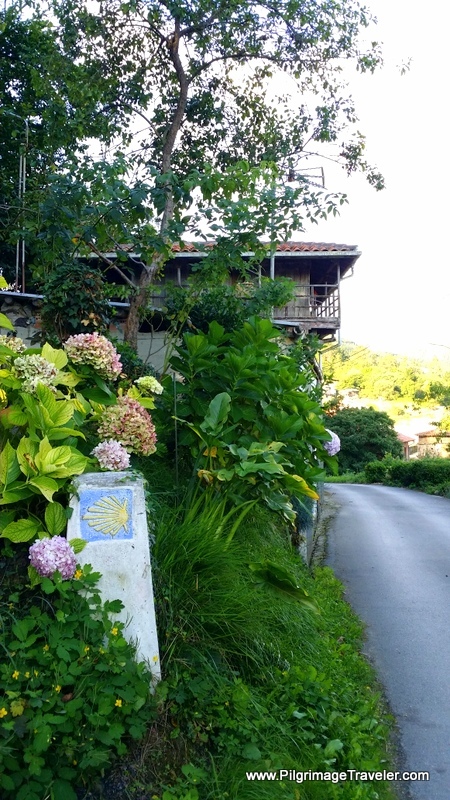 On the road to Llamas, we encountered another raised Asturian horreo, which made a picturesque backdrop for the Camino waymark and hydrangea bush. The path we missed from the SL-7, led us into the woods, for a brief reprieve on our feet and shins. Any path that diverts off the pavement is a good one! 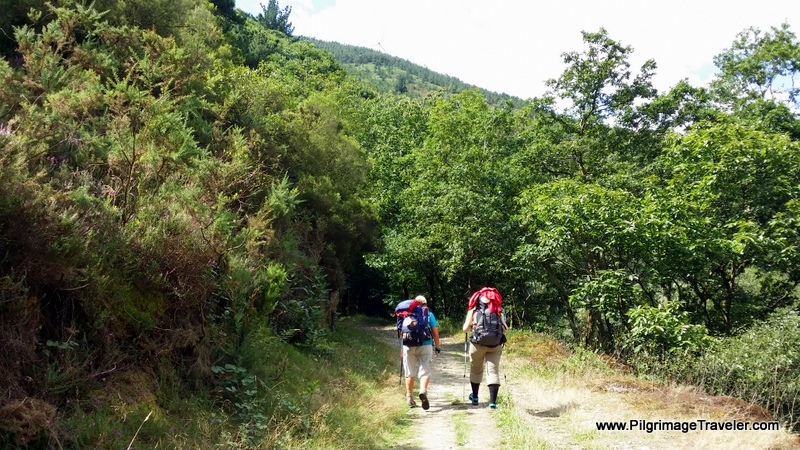 On day three of the Camino Primitivo, the way was almost entirely on pavement up to this point. My shins still hurt, but not quite as badly today. Finally they were adapting to all the pavement walking. If you look closely at the photos of my husband farther down, you will notice that he moved his elastic supports from his knees to his shins! Ha ha! The path gives way to another quiet road that leads the pilgrim downhill to the next hamlet of Llamas. I have no idea for what this interesting, round building is used. If anyone knows, comment below, and educate all of us! After Llamas, the Primitive Way is a long straight walk towards Quintana, but actually skirts to the north of it. At the junction, at end of this straight road, there is a fuente (fountain) with a foot pool, and very nicely shaded picnic tables. A half kilometer after the fuente with the foot-bath, you encounter yet another rest area, with a fountain and a rain shelter for pilgrims. Since we had absolutely no food, we did not stop. Sure didn't stop me from thinking about my plight, however. It was around 10:00 and my stomach was really gnawing on me! The more I tried to forget about it, the more impossible it became. 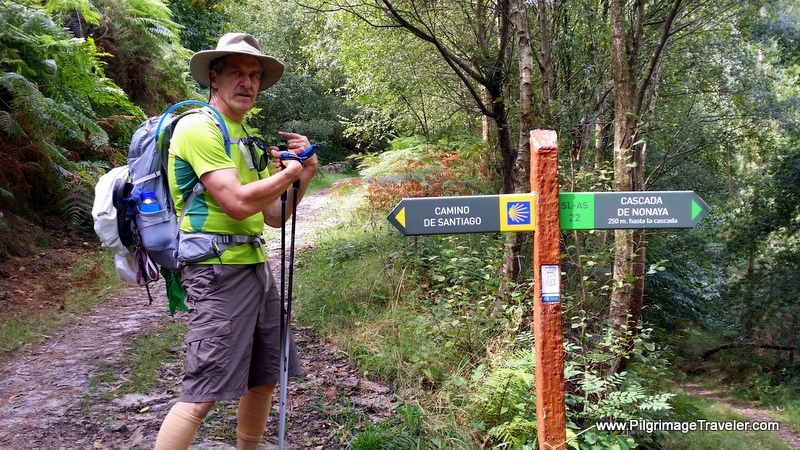 At least my feet and shins were relatively happy, as day three on the Camino Primitivo diverted once again onto a path in the forest for about another kilometer or so. It was a nice, gradual uphill as well, here, which relieved my shins as well. Waymark into the Forest, Yay! When the Original Way rejoins the pavement, it lets you out by mill-like building adjacent to the Rio Nonaya. This is a lovely and peaceful place, and we encountered very few pilgrims. 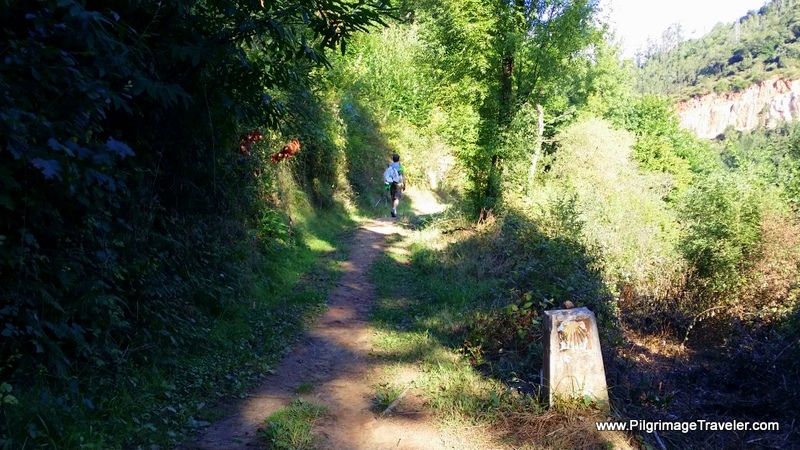 The Camino crosses the N-634 in another short while farther on and follows it to the north on a dirt track before turning into - and through Salas. 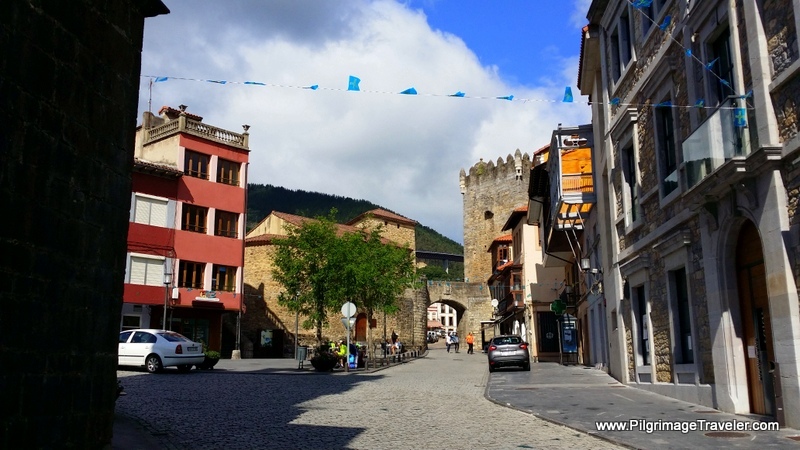 As one reaches the center of town, the Castle looms overhead, built in the 14th Century we were told by the locals that day, but according to other sources, the 10th century. 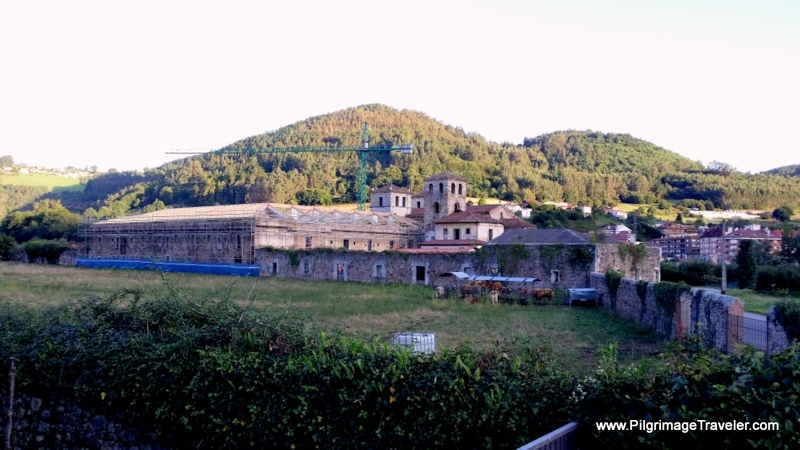 This castle was the birthplace of Fernando Valdés-Salas who was the founder of University of Oviedo, Archbishop of Seville and an Inquisitor General of Spain. This man was not a nice man, if you read about him through the link. Too bad the town is named after him! We rejoiced to find the Bar La Luciana at the foot of the fortifications. It was 11:00. We had walked a full 15 kilometers (approx 9 miles) on a few handfuls of blackberries, a small apple and a few hazelnuts! I think I ordered everything on the menu! Eventually, pilgrims that we had just met joined us, and several more that we would meet that day. Most of these folks would go on to be our Camino family for most of the Original Way. 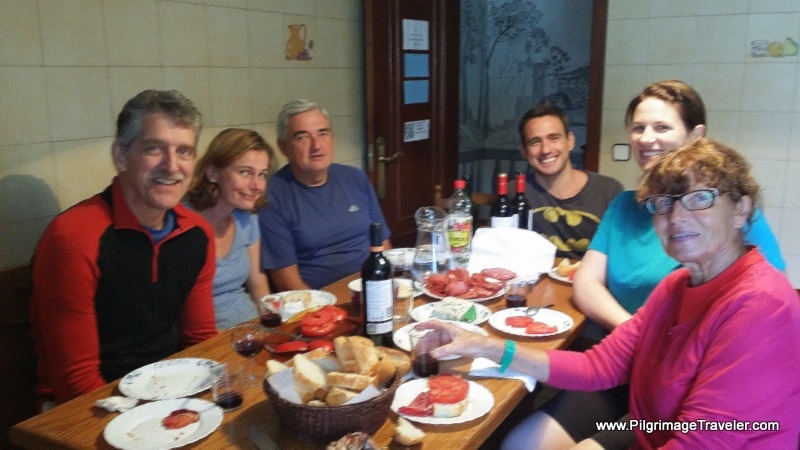 By day three on the Camino Primitivo, our "family" was becoming well formed. We felt very grateful that we were able to stop, eat and rest in this most historic place! I was amazingly surprised that when we went to pay our bill at the bar, the lady said, "wait a minute" and then brought us each a banana and a mini-bocadillo (sandwich) for the road! I was humbled by this sweet act of kindness, when we could so easily afford to pay for our own! Please visit the Bar La Luciana, if you stop here in Salas! The food is great and so is the view! Plus they support us peregrinos! After our lunch we took a few minutes to have a look at the 16th Century church of Colegiata de Santa Maria la Mayo, in the center of town. Not very ornate or brilliant, but impressive, non-the-less. While waiting for our food to be served, I took a spin through the mini-market close to the square and bought lots of snacks for the road. As we set off, my belly was quite full and content, and my pack was full of lots of food! 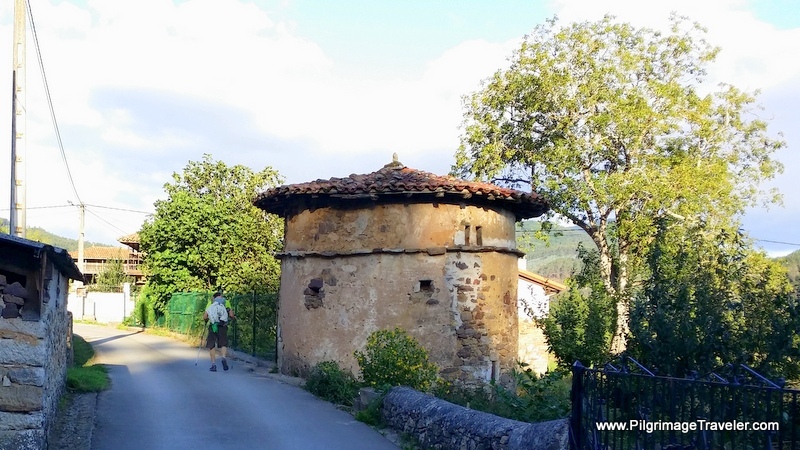 There is a municipal albergue, the Albergue de Peregrinos de Salas, just beyond the fortifications, a few meters off the Camino, if Salas is your destination for the day. 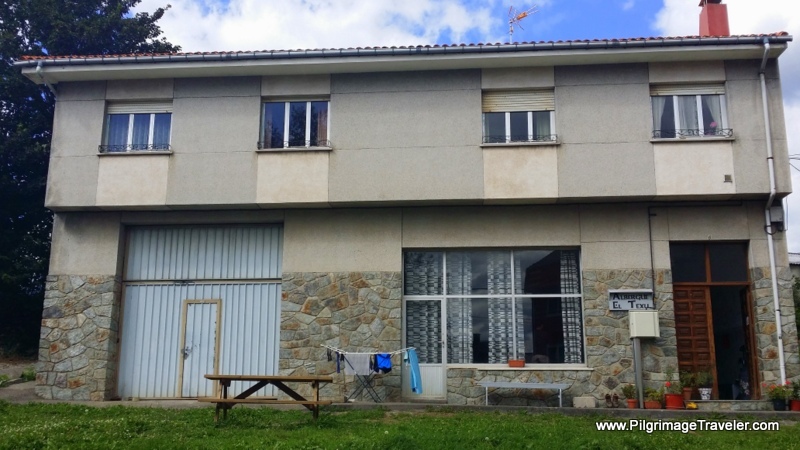 For other albergues and accommodations, click here. 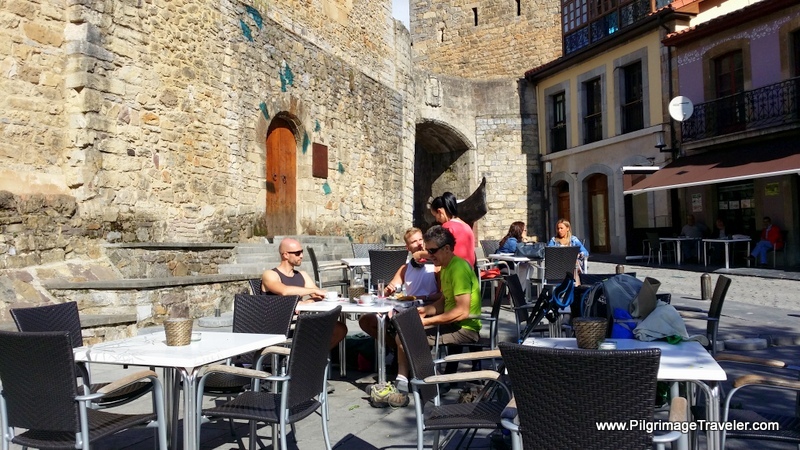 The afternoon of our day three on the Camino Primitivo took us through the castle gateway in Salas until it gave way to beautiful large track for several kilometers of no pavement!! 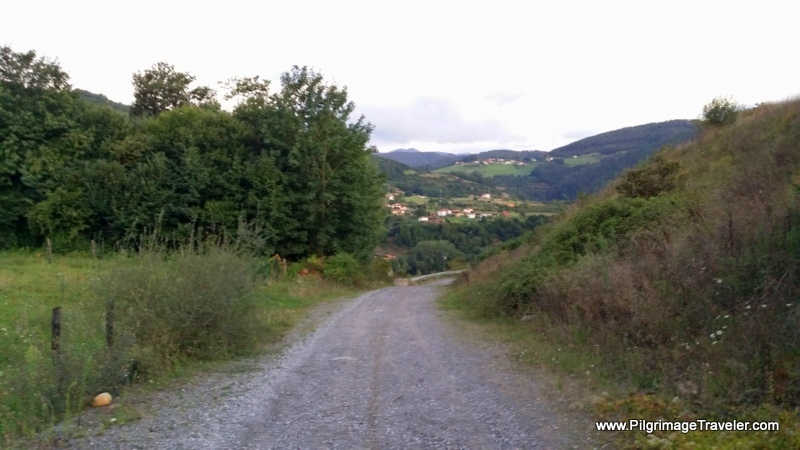 After Salas on day three of the Camino Primitivo, it is a long, steady uphill. It was during the afternoon sometime that my right big toe started hurting. More settling in, I suppose. Dang, this was harder than I thought! Even with a full belly! I could at least be grateful that it wasn't raining! It was indeed a gorgeous, clear day. In this photo you can clearly see that my husband, Rich is sporting his knee supports on his shins. I tried the same for awhile! Our knees were fine - it was our shins that were hurting. I didn't really feel that putting the supports on my shins helped all much, but I did it anyway, just in case! 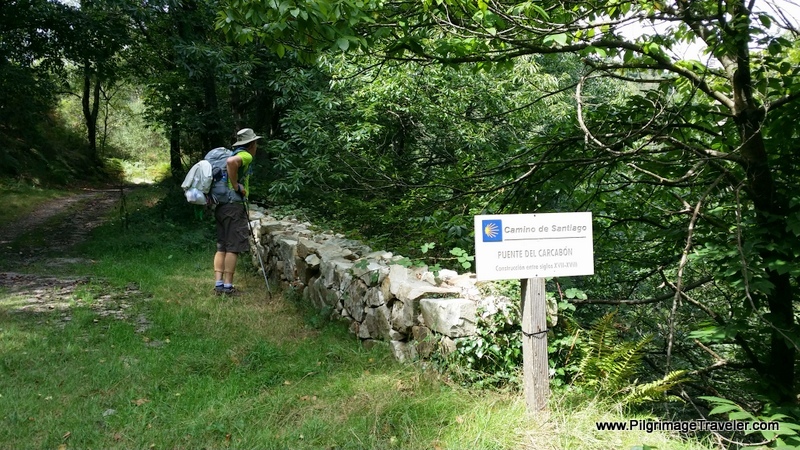 Here the lovely forest path is marked with a Camino de Santiago signpost. There is also a sign for the Nonaya waterfall to the right, a short diversion of about 150 meters if you desire to see it. 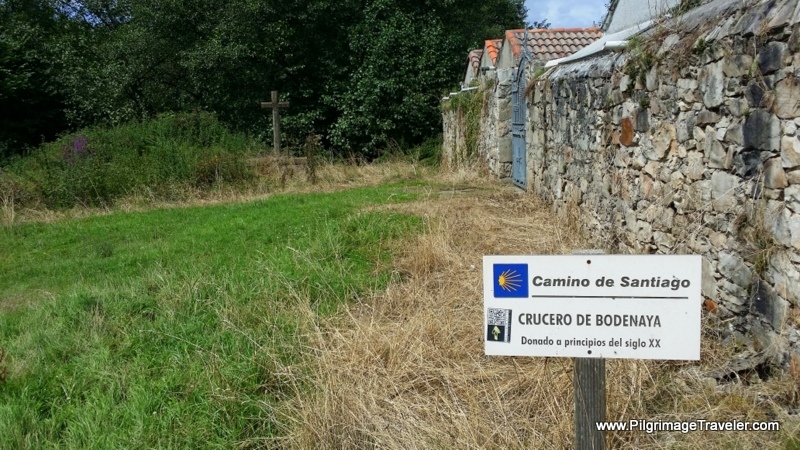 Camino de Santiago This Way! Three kilometers or so after leaving Salas, the forest track reaches this bridge, the Puente del Carcabón, as the signpost shows. The Way continues to climb, up and through the forest for most of the afternoon's walk. 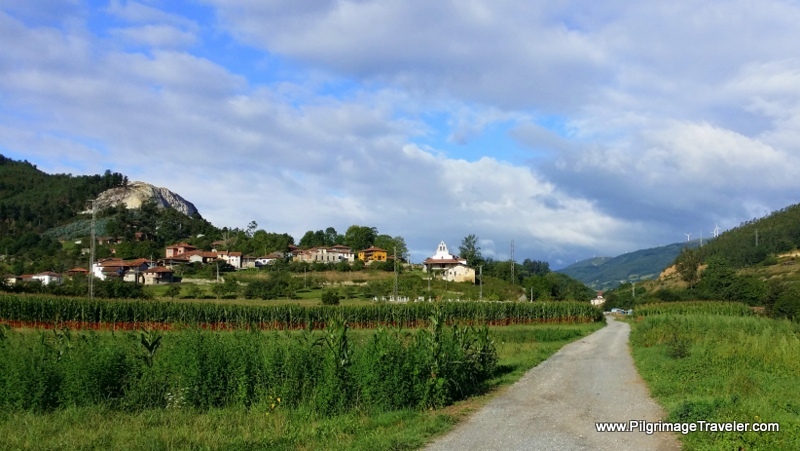 There are very few towns, and mostly forest and countryside walking from Salas to Bodenaya! There is a stretch where the Original Way crosses and joins the N-634 for a short way, then goes under the M-634 as it continues its climb towards Porciles. Busy Road N-634 Under the Motorway - No Me Gusta! 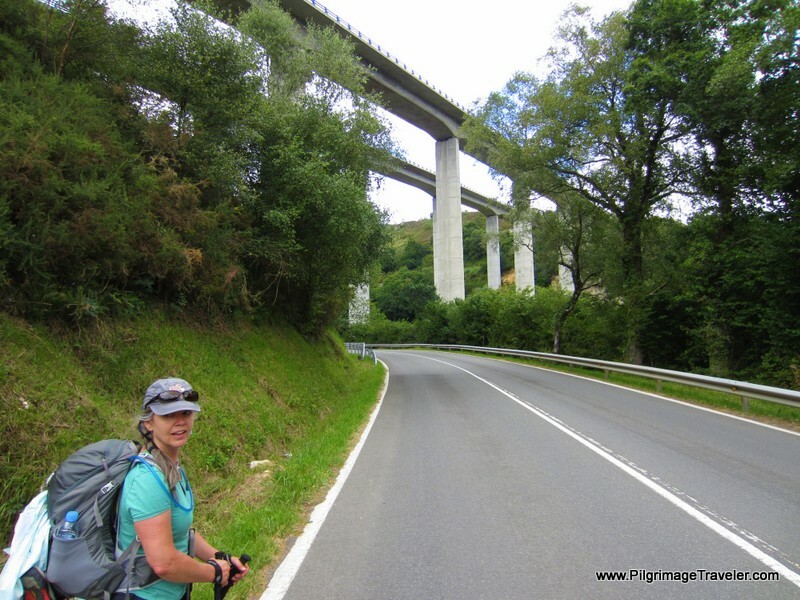 Despite the hardships of this day three on the Camino Primitivo, with about an hour left to go, all-in-all I felt wonderful! This was in spite of the fact that it is a significant climb from Salas to La Espina, an elevation gain of almost 500 meters (1600 feet) in the first six kilometers. Not for the faint of heart! The countryside shimmered with the green of late summer as the sun continued to shine brightly on our walk. I felt lucky. My outlook had greatly improved with a full belly. Plus the uphill climb actually invigorated me in this particular moment! Fortunately, the Original Way follows a service road along the N634 on a track to Porciles. The country lane to Bodenaya is shown below. Our destination is not far away now. A crucero marks the pilgrimage travelers entry into the hamlet of Bodenaya. La Espina is just a short kilometer away. 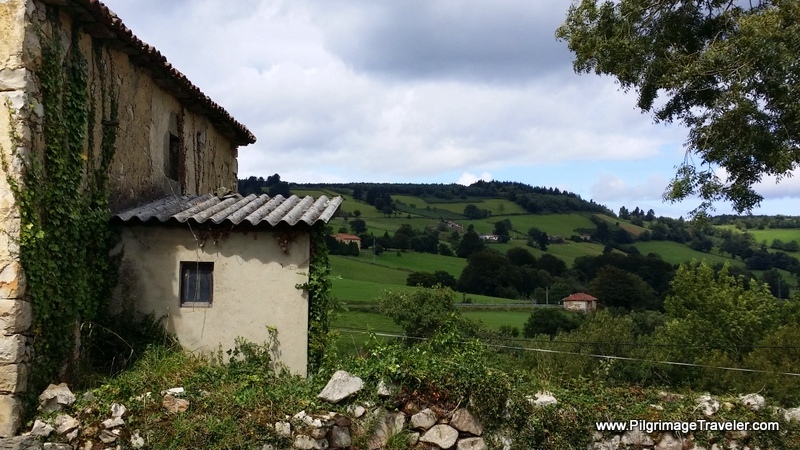 The Albergue de Peregrinos de Bodenaya right along the Camino is here, and comes highly recommended, but we continued on for one more kilometer. 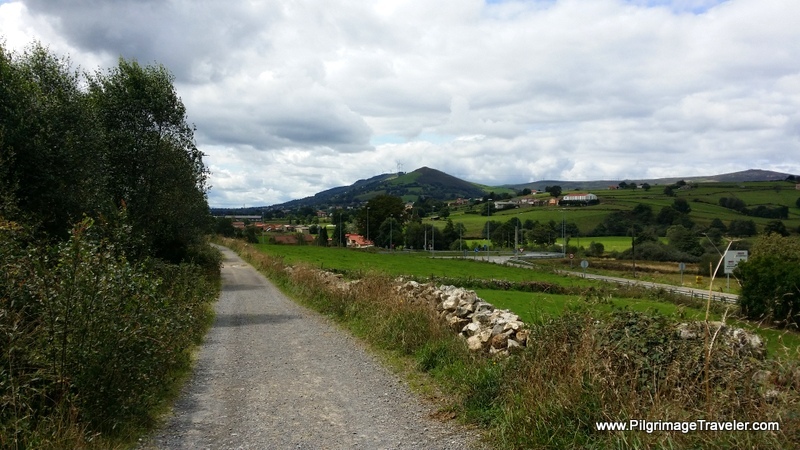 This day three on the Camino Primitivo was a hard one for me. The Original Way is more uphill and downhill than my actual body realized it was going to be. My mind knew it, from all my reading, but on this third day, my body really needed to acclimate as I pushed through the day. The private albergue, El Texu, in La Espina where we stayed, was very comfortable and had private, double rooms with queen-size beds in addition to the dormitory-style bunk room. It also had a nice kitchen and you could have the attendant wash your clothes for a fee, instead of doing it yourself. 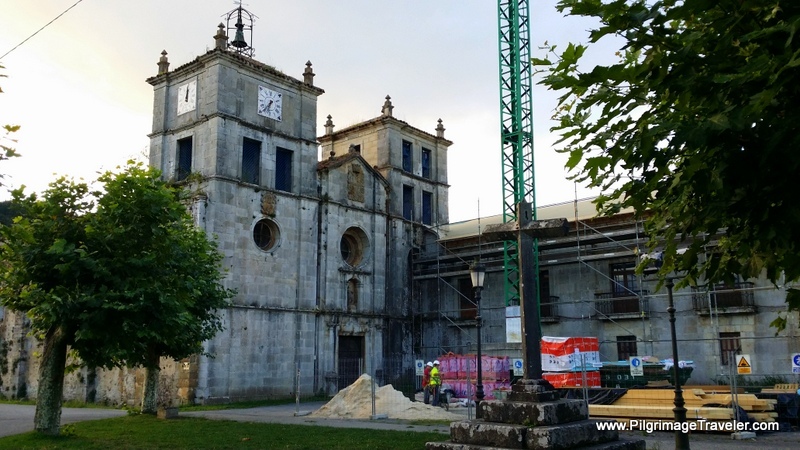 There is a donativo albergue, the Albergue de Peregrinos El Cruce, a bit farther along the Camino on the west end of town, with only 10 places. There is also the privado, the Albergue Casa Aladino, with 18 places, and the Pensión Dakar, with 6 places and three rooms, right in the the center of town. See the map for the exact location. Here is a photo of our evening celebrations in the albergue with the family, left to right- my husband, Rich, Lisbeth, Augusto, Andreo, Saskia, and Glyvia. A lovely meal with new friends to end our day three on the Camino Primitivo. They all confirmed that staying at the monastery in Cornellana is an experience not to be missed! Oh well, I guess this gives us a reason to go back. As I reflected later about my morning without food, I thought that I would have been a lousy pilgrimage traveler in days of yore. I simply could not get my mind off my hunger. The medieval pilgrims must have suffered tremendously, relying on the charity of the townsfolk along The Way, never knowing where they would get their next meal. Clearly, I was nowhere near starving, but I was quite grouchy, even though I kept it to myself. Whether or not it was a purely mental obsession with food, I was so close to sitting down and saying to my husband that I just could not go on. Yet what good would that have done? My husband didn't seem to focus on the lack of food. I honestly think he could have gone all day without any. 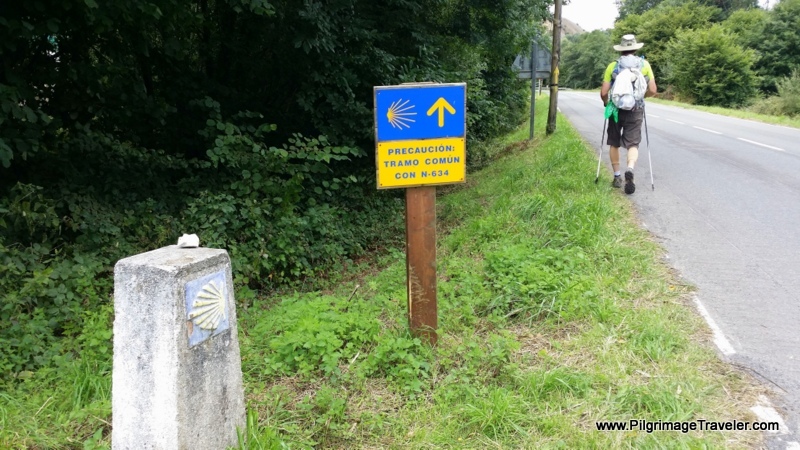 The combination of my shins hurting, my sinuses dripping and my belly growling was just too much for me on this day three of my Camino Primitivo! I guess I am not as spiritually mature as I think! Somehow, I did manage to go on, despite my unhappiness. I did have it in me, because I did it. However, I vowed that never, ever again would I set out without any food in my pack. I had to closely examine my relationship with food and what deprivation might truly look like. This may have been the closest I have ever come in my life to real hunger. Yet, what was it really in relation to world hunger? 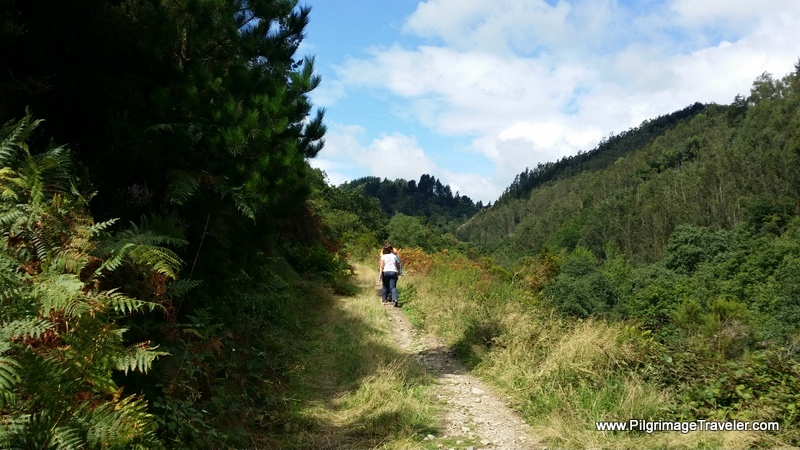 May your own Camino de Santiago be filled with the wonderings of your own way of being. May you be prepared well, and may you face adversity with awe and wonder at your own pre-conceptions of reality. 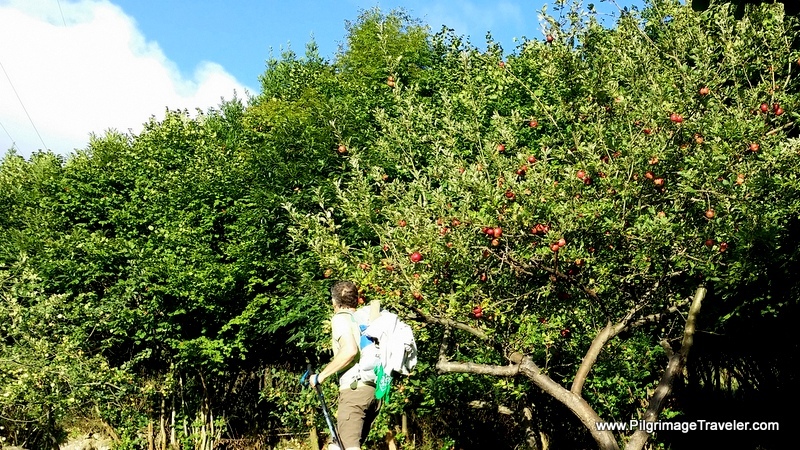 May the wind be on your back, the sun on your shoulder and the fruit of the earth be manifested for you on your own day three of your Camino Primitivo!